Influential Clarets midfielder Steven Defour isn’t ruling out the possibility of ending his playing career at Turf Moor. The creative Belgian, now under contract at the club until the summer of 2020, will weigh up his options once his current deal expires but, should it suit both parties, the 30-year-old would consider seeing out his playing days at Burnley. Defour, who was a record buy when joining from Anderlecht for around £7.5m in 2016, has made it no secret that he would like to finish his career where it all started at Mechelen. However, as his representative Christian Pala confirmed earlier in the year, it would all depend on which step of the ladder the Belgium outfit are operating at. Speaking to the Burnley Express at the Etihad Stadium, when questioned about ending his career with the Clarets, he said: “It is one of the possibilities. I am not taking anything for granted. “I want to work every week and show what I am capable of and show that good level that I was on last year. I want to be at that level really soon and we will see what happens. He added: “It has been a tough last couple of weeks and months, injury wise, my dad passed away so I am trying to enjoy every moment now. Defour made a welcome return to Premier League action in defeat against reigning champions Manchester City. The former Standard Liege and Porto man had been sidelined since January after requiring surgery on his knee. After making his comeback in the top flight, he said: It has been a while, you know it is going to be tough at Manchester City but you have to start at some point. I was fit to play and the gaffer put me in. “Normally you have to adapt again to Premier League level because U23 football is not the same level so I want to be ready for the games that really matter for Burnley. It was good to be out there and get some freedom even though it was tough. “It was good, physically I felt fine, of course I was a bit tired at the end but I feel I am getting really close for the next few weeks. Defour missed the final 14 games of last term as the Clarets nestled in seventh spot, entering the Europa League qualifying process as a result. 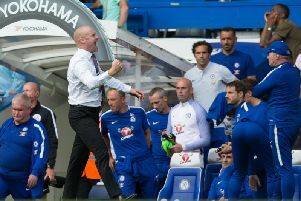 The midfielder accepts that emulating that success would be difficult but he doesn’t see any reason why Sean Dyche’s side can’t finish up in the top half. “We could (finish in top half),” he said. “There are signs of it, we have not played good but picked up points.